The Iranian Theocracy staged an unprecedented play in two acts for the president’s inauguration. Hundreds of pictures showed the predominance of the chauvinistic cleric and military, all observing the same code of connections, corruption, and cronyism. They did not represent a sample of the voters. There was no room for the women, young generation or minorities. Act one was a ceremony for domestic purposes: how the Velayat-e Faqih perceives the president for whom the voters were enrolled for figuration. Let’s call it The Appointment. Act two was a celebration for the world to see and the international media to report on. Rouhani was to take oath as the new president in the parliament amid foreign guests invited for the occasion. Let’s call it The Oath taking. It took place on Thursday, August 3, 2017. During a dull and drab ceremony, the Supreme Leader was to give his blessing, the Order/Hokm, for Hassan Rouhani’s new term in office as the elected president. 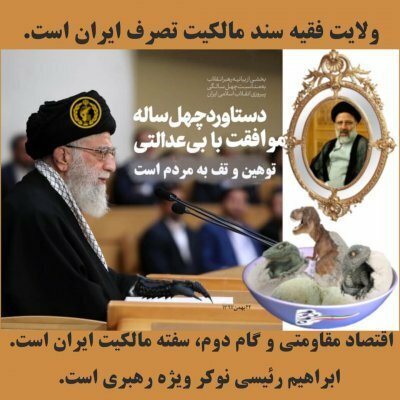 The Iranian media reported Rouhani Appointed/تنفیذ President by the Supreme Leader, Ali Khamenei. We did not understand what تنفیذ meant. This has happened far too often since the Khomeini dialect, a Farsi-Arabic mixture, became the official language of Iran. Now, تنفیذ is a declension of an Arabic noun, a made-to-order word in Farsi to serve the purpose of the regime. Since most of the Farsi speakers in Iran were as clueless as we are about this neologism of the Islamic Republic’s realm, the media added a noun (also Arabic) but better understood. Appointed منصوب was the word. In Iran, one is appointed when a higher authority designates one to carry a job under one’s authority. So Rouhani was appointed by the Supreme Leader as president. Till now we were made to believe that he was voted in by universal suffrage; now we have the proof that unless the Leader gives his blessing, the president is Mr Nobody. The mainstream media in English used endorsement/ اعلام پشتیبانی، تایید which were far behind the notions implied by the Iranian media. Splitting hairs in linguistics? No! not so much, as the word appointed /منصوب is more appropriate for whatever Rouhani does as president under the Leader’s orders. The official title of Rouhani is His Reverence in Islam and Muslims/حجت‌الاسلام والمسلمین . All words are in Arabic. Farsi? Forget it! The Iranian Shiite rules the country and uses his own cant and ready-to-serve words by misusing the grammar and the declension. An Islamist-Arabic realm for the men in charge of Iran. More to the point was the Arabic slogan, used as decoration. For an average native Farsi speaker, the Arabic sentence was meaningless. For good reasons, they are illiterate in Arabic. Even so, millions in Iran read the Koran piously, parrot like, written in Arabic and do not care at all about the meaning of the words. Isn’t there an absurdity in reading an Arabic slogan, hardly understood by many, in an official ceremony to appoint the president of the Iranians? To make sure that everyone is aware that the theocratic Shiism is ruling the country, the building in which the appointment took place, Hosseinieh Emam Khomeiny, was the choice. Hosseinieh, is a location that commemorates the killing of Hussein the 3rd Shiite Imam in AD640. The edifice is an uninspiring large public room, with an impressive proscenium for the personal use of Ali Khamenei, when he meets the public. Only the highest authorities, or a chosen few among the plebs for propagandist purposes, would share the sacrosanctity of the proscenium. The leader, as usual, was seated on a high-back chair, towering over four men sitting cross-legged on the carpet beside him. To his right (in the Iranian etiquette, the loftiest honour for a guest) were the two pillars of the Velayat-e Faqih, in strategy and realisation: Ayatollah Sadeq Ardeshir Larijani – Amoli, the Chief Justice of Iran, and Ayatollah Ahmad Jannati, Chairman of the Assembly of Experts. 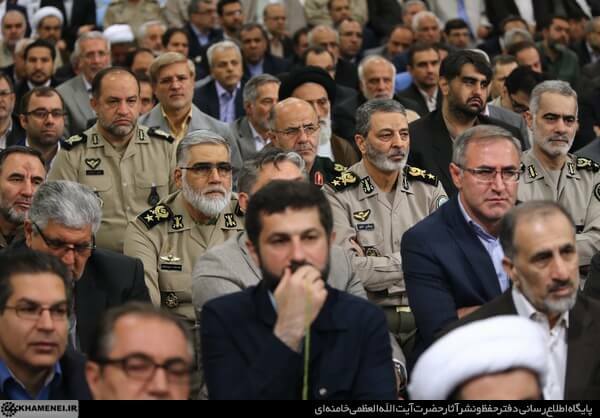 To his left (where guests of lesser importance are asked to sit), Hassan Rouhani, the president and the speaker of the parliament, Ali Larijani, a brother of the Chief justice. With a thin layer of rigged electoral process to give them a legitimacy, and being the most experienced implementers from Khamenei’s seraglio, they know too well what the regime is expecting from them and what their responsibilities are. They answer to the Leader, Agha, who provides them the necessary religious legitimacy to rule a conservative society. The Iranian citizens have the right to vote for whomever they are told to. Their deputies are unable to see themselves as part of a larger sovereign people, unless the latter demands it. For now it is not the case. The infallible Supreme Guide of Iran, the sign of Allah on earth, entered the proscenium from a back door. Such an august person is never to be seen among the throng. Are they a sample representing the voters and citizens? The A-List of the theocracy crowded the front of the house, sitting cross-legged, except for the VIPs using folding chairs to the left and the right of the proscenium. The audience were clerics with turbans and robes, the military in uniform and their minions in suits, with shirts, and no collars. Average age? Well passed forty. A snapshot of the ruling elite: clerics, military, and hand-picked civil servants, all observing the same code of connections, corruption, and cronyism. They did not represent a sample of the voters. The naive voters queued up at polling stations a couple of months ago. Three-quarters of them young and half of them women; they thought themselves as being cultured and civilised, wanting to live in cooperation with the rest of the world. They proudly and joyously smiled and waved to the cameras, and conned themselves into believing that they would re-elect a president for the changes long overdue. Your are banned from the celebrating the president you endorsed. You were enrolled for figuration in the elections. Now, you can shut up for the next fours years, Ali Khmanei dixit. The Appointment showed them otherwise. The photographs of the ceremony were published by the Leader’s bureau; no other journalists were allowed in. In the pictures, the Rouhani voters were dramatically absent. Hundreds of pictures showed the predominance of the males – cleric and military. There was no room for the young generation or minorities. Keeping women in a a recess and enclosed by iron railings. Caged birds? Segregation? Apartheid? So little for more than 40 million she-Iranians. As second-hand citizens, they can vote but have no right to be a candidate for the presidential election. 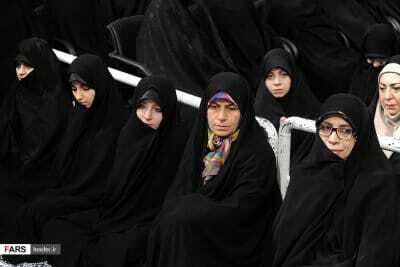 They can be mothers, but the Iranian citizenship would not be transferred to their children. They can travel alone and have a passport, only if they have the permission of their husbands. They are citizens in the shadows and are called to serve when needed. The key speech was delivered by Khamenei. Other speeches, including the one from Rouhani, were pale versions of what he had said: hot air that had been repeated for forty years. There were no street parties celebrating the new term of presidency. Out of habit and with the weekend in mind, the Iranians had better things to do. Business as usual. The whole propaganda machinery went into full swing for the oath taking ceremony on August 5th. The pleasure of the company of foreign delegates was requested for Tahlif/تحلیف. Another Arabic noun ready to order for the occasion. The Islamic Republic of Iran is desperate to be recognised as a Superpower/ ابرقدرت, forgetting in the process that it cannot be done without its citizens. As long as the Iranians leave the country in their hundreds each year to settle in another country, as long as the younger generation is out of work, as long as women are kept out of social and political activities, as long as ethnic and religious minorities are not respected, Iran will only be a regional power ruled by autocrats that buys its allies. Nothing more. The Iranian media were frenetic in reporting the arrival of the hundreds of foreign delegates. The words used, the exaggerations put into the arrival of delegates of a few countries, together with the closure of building offices and hundreds of roadblocks being placed in Tehran, promised an international gathering akin to having the leaders of a grand G20 summit. The tiny number of delegates, one or two dozen, arrived as droplets, few and far between. However, the capacities of both Iranian airports were stretched to the limits of breaking down. Iranian airports are used to manage the charters of pilgrims from neighbouring countries. The passengers can be pushed around and bullied at will. The same treatment would not work with foreign delegates. The result was chaos and improvisation. The Iranian journalists and photographers, stationed in airports and hotel lounges, made the most of it by taking pictures from the moment each delegation landed to the moment it reached the hotel, with most delegates rolling their suitcases. Thousands of pictures were taken and published, though, lacking information, they could hardly put a name to the face of any of the delegates. Before the ceremony, each delegate was to meet an Iranian official, according to his rank. The meetings were reported by using the same template: Mr so-and-so, in-whatever-capacity, visited an Iranian minister. He praised the Glory of the Iranian Revolution and exchanged views on international matters of the highest importance. We did not understand why, during the meetings, some delegation’s flags were present alongside the Iranian flag and some others were not. Perhaps there is a shortage of some foreign flags or someone has not thought of having them at all. The star delegation represented the European Union. The ladies were headed by Federica Mogherini, High Representative of the EU for Foreign Affairs and Security Policy and Vice President of the EU Commission. In a nutshell, a VIP in the Nuclear deal (JCPOA) and its aftermath. Before The Oath, she met with all the people in Iranian politics that count in the JCPOA deal. The unpredictable US president D. Trump and his grabbing family have made once-great America an international laughing stock and thus wiped out the little credibility left for the country. This makes the Iranian officials very nervous.Perhaps the ayatollahs and D. Trump have far too much in common in the way they perceive the world. The parliament was to host the The Oath taking, a novelty in the Iranian political institution. Once again, clerics and military were largely present even if they were not MPs. The atmosphere was relaxed; even some figures from civil society were asked to join. The women MPs and foreign lady members of the delegations were seated discreetly out of the way, so as they would not crowd the major male actors and pollute the official pictures. The ceremony itself was not impressive and much lacked panache. Rouhani, the elected president, was once more escorted by the Larijani brothers and Ayatollah Janati. This time, the ceremony was open to hand-picked journalists. Many pictures were taken and revealed who talked to whom, who was seated next to whom. The published articles in Farsi were more like accounts in people’s press than anything worth noting for social and political purposes. Just wait and see … the second-term mandate of the Iranian president is that of decline and waning before falling in disgrace. A tradition in Iranian politics. Federica Mogherini was seated in a corner. A woman sitting next to Ayatollah Janati and Sadeq Larijani would have been highly inappropriate. The next morning, curtains were down and foreign delegations left Tehran, including Ms Mogherini’s. However, when visiting Iran, a Western she-political figure may expect a bombshell to explode any time. Micheline Calmy-Rey, Emma Bonino, the all-female Swedish economic delegation and Catherine Ashton have all triggered a bombshell. In Iran, they were criticized for being bad-hijab or contacting human rights activists, victims to the Iranian chauvinism. 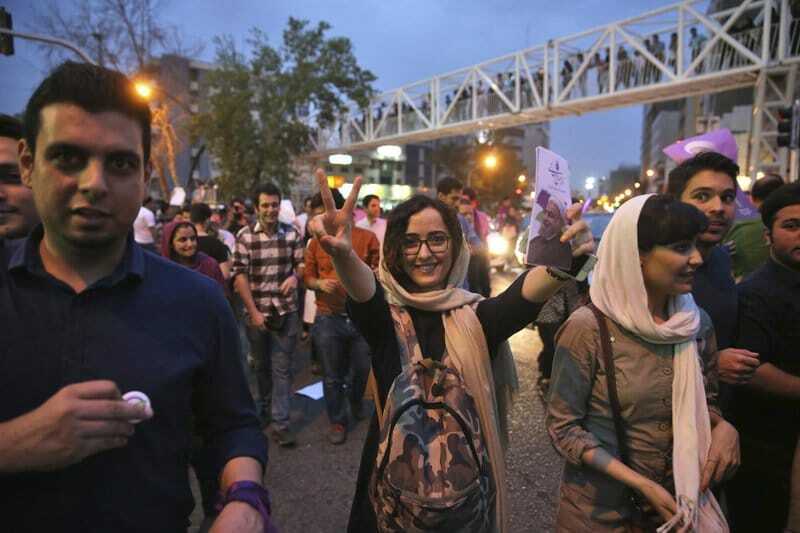 Upon their return home, they were criticized for wearing the hijab in Tehran and being mute on the human rights issues. Just before the official opening of The Oath, a crowd formed around Ms Mogherini on the floor of the assembly. She was approached by some MPs, some in turban, all wearing a large smile, eager to take selfies. They behaved like a bunch of overwhelmed puerile boys meeting Lady Gaga unexpectedly in a courtyard. Something that they would have never have dreamed of doing if Ms Mogherini was a she-Iranian. The next day, Rouhani’s mediocre performance in The Oath was forgotten. But Ms Mogherini’s pictures with a bunch of immature and third-rate Iranian MPs made the local headlines. For once the papers did not pick on the lady. To the contrary, the MPs were accused of losing Iran’s face, on the international scene. The selfies were holy bread for social media. The overused clichés were repeated, focussing on her as an Italian; why does she wear the hijab in Tehran at all? Ms Mogherini, usually a keen tweeter, kept silent about the incident. For sure, as long as the hijab is forced on women in Iran, as long as the Iranians, male or female, go on wearing Janus masks that fall off easily, as long as there are women that accept being made to sit in a recess and keep quiet, more bombshells will explode. No farce and improvisation from a phoney president will change it. Only a Republic of Iran without the Islamic razzmatazz would put the Iranians on the road for change.